The macrobrachium genus, also known as the Malaysian Prawns, is a member of the shrimp family and consists of about 30 species. The macrobrachium, or large arm, genus lives throughout south-east Asia. Unfortunantly, due to its relative rarity in the aquarium world, some species of Malaysian Prawn are sold by some unscrupulous store owners as blue lobsters. Thanks to a growing popularity that began in the late Eighties, more and more people are being introduced to this wonderful animal under its proper name. Raising Malaysian Prawns makes an excellent sister hobby to raising crays, crabs, and shield shrimp. 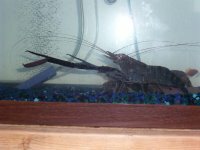 Care and feeding are similar to those of crayfish, though water pH should be just slighty (7.2) alkaline. Water temperature should be from 20-22 degrees Celsius, slightly warmer than what most crays prefer. Be sure to include plenty of live food such as earthworms, leeches, and maggots. Plants are important too, as a diet poor in chlorophyll can cause loss of pigmentation and abnormal molts leading to death. A fluorescent light should illuminate the tank eight hours a day to simulate a normal day cycle. Do not leave pets or small children unattended with a Malaysian Prawn. Scientists believe the Malaysian Prawn descended from marine species some 13,000 to 18,000 years ago, after the end of the last Ice Age. Its last common ancestor with crayfish, however, probably lived well over 500 million years ago. While it prefers fresh water during most of its life it must return to brackish water to mate. In Malaysia and surrounding regions it is not unusual to see parades of these gentle creatures frantically scurrying over dry land during mating season. Some countries have even instituted fines for harming the prawn during their migration. 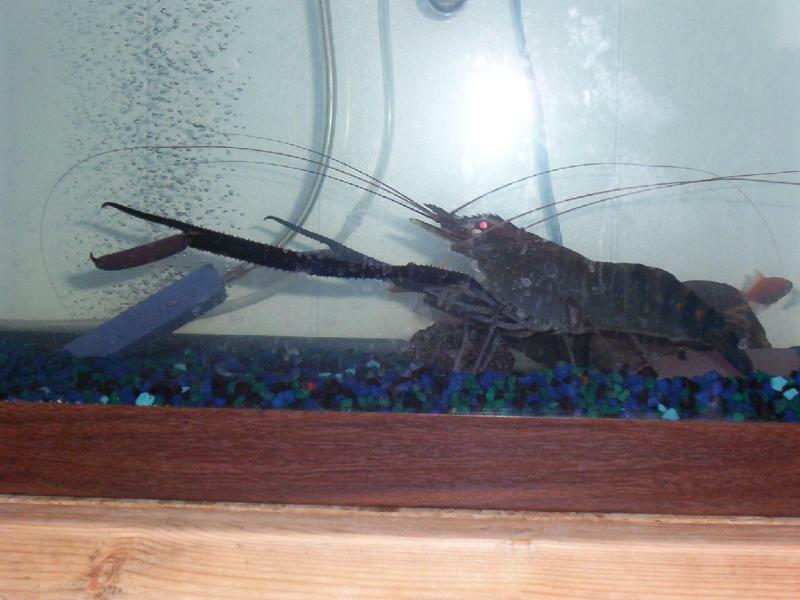 The most pressing issue concerning the Malaysian Prawn currently is whether it would be victorious against a crayfish of similar size and aggression in a fight. Animal Planet recently aired a series that staged various species of animals in fantasy fights. Unfortunantly, only computer models were used, though there is a push for actual animal fights in the next season. 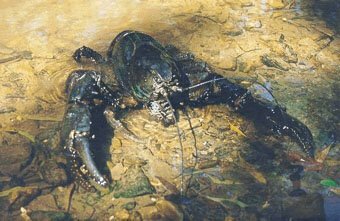 Reportedly producers are looking at pitting a Giant Tasmanian Freshwater Lobster (astacopsis gouldi) against a Long-Armed Malaysian Prawn (macrobrachium rosenbergii) for the season pilot. Crustaceanists everywhere eagerly await the results.